You might remember David Low as the guy whose work illustrated your social studies text book on World War II. 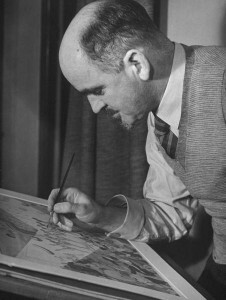 In the 1920s, early in his British career, the New Zealand-born cartoonist drew what was effectively the original Muhammed cartoon. Except he didn’t mean to. Celebrating cricketer Jack Hobbs’ equalling of W.G. Grace’s batting record, he depicted a statue of Hobbs on a dais above various lesser notables such as Adam, Julius Caesar, Charlie Chaplin and, as you may have guessed, “Mahomet”. Recent versions of this story have played out more dangerously. But this is (in part) an extreme example of a problem that satire is prey to: misunderstanding. One might, sometimes, justly take pride in offending people by making fun of something they think is sacrosanct. But sadly people will also get angry (or be pleased) by something you didn’t mean at all. Low attributes the trouble to thoughtlessness. Thought and craft help, but in fact it’s a professional hazard. All attempts at communication, arts included, have to face the gap between the author and the audience. This applies very strongly to satirists. Not only are they trying to send a particular message, but they are doing so using peculiarly indirect means. That gap opened up in front of Low rather more than once. Another instance: his character ‘Colonel Blimp‘ was a portly, mustachioed ex-military gentleman who made contradictory statements on political affairs while in the sauna. Low was targeting irrational conservatism rather than, for example, military incompetence, but Blimp took on a life of his own. Not only did he mean something other than Low meant him to – ‘blimp’ came to be used as a generic term for army backroom idiots – but Low once found his own opinions unfavourable compared to selected quotations of the Colonel’s. Jokes rely as much on what is not said as what is – on the shared assumptions between the teller and the audience. While satire need not be comical, the jokes it does make are open to this problem. And there is another one: irony. Satire has grown up side by side with deliberately not saying what you mean. As literature, it has all the issues that sarcasm does as conversation. Your audience has to correctly work out your intentions – and first they must realise you’re not being direct. And even that initial recognition takes some skill on both sides. Satire often says things about real people which are not literally true. It turns out, this is asking for trouble. Scoop tends to use an explicit “satire” label to help things along (This article is partly in explanation of and apology for that practice). And yet, I’m told that a least one member of the public service, after being alarmed by my article “Key Cancels “Wasteful” Employment Summit“, had to have the meaning of the word “satire” explained to him. As a failure to communicate this was disheartening, but it did confirm to me that the human race is ripe for mockery. Elsewhere, a piece by comedian Andy Borowitz, titled “Cheney Challenges Hillary to Hunting Contest“, was picked up by the Boston Herald as real news after it appeared on the Huffington Post website. The most prominent and probably the most prolific source of satire on the internet is fake-news site The Onion. If you’ve been paying attention, you won’t be surprised that The Onion’s wikipedia page has a section titled “The Onion taken seriously“. The most memorable example derives from their 2000 article “Harry Potter Books Spark Rise In Satanism Among Children“, which was adapted into a moral- panic email and quoted by Christian conservatives opposed to books about magic for children. Context is important – and the ease with which something migrates out of its original context on the internet contributed to those mistakes. It certainly did in the case of “MC Emu“. A kiwi-born rapper whose stylings were popular on the German nightclub scene, MC Emu (otherwise known as Damian Roberts) was an entirely fictional person invented for an issue of student newspaper Critic in which every feature article was made up. More hoax than satire, but this did not prevent him showing up in a google search and thence winning a mention in the appendix of a book on New Zealand popular music. Another traditional hint of satirical intent is that the content could not possibly be real. For example, you could use comic exaggeration to make whatever you’re mocking ridiculously prominent, to an unbelievable extent. But anyone familiar with the inhabitants of the wider Internet (let alone the rest of the world) will be aware that opinions on what is unbelievable vary. And that it is, in fact, often difficult to outdo nature in the depiction of human risibility. The satirist is trying to create something that rings true but is not, in fact, real. This goal is perhaps a relative of American faux-right-wing-commentator Stephen Colbert‘s concept of ‘truthiness‘. Unfortunately, Colbert invented that word to point out that some people will believe anything they want to. Good for hoaxers, but a potential problem for satirists with a wide audience. While this might prompt questions about the intelligence of American conservatives, it also reinforces the usefulness of a shared worldview when dealing with satire. 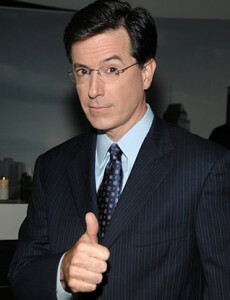 It’s also worth noting that “There was no significant difference between the groups in thinking Colbert was funny”. Even when satirical intent is noticed, the audience needs to share – or at least recognise – the author’s preconceptions for the satire to be enjoyed – or at least understood – as the satirist hopes. This means the satirical voice is not naturally revolutionary or egalitarian. It’s easy to target moral or intellectual incoherence – traditionally called “folly” – with satire. But it’s hard to make people think differently, and only people who in some sense already understand will get it. And because irony is always ambiguous, misunderstanding the intent often gets it exactly backwards. I’m no expert, but that sounds like getting lost in multiple levels of irony. And if it seems silly to me, just imagine how Juvenal would feel. The ‘problems’ I’ve described here are those of a writer trying to put a point across: being misunderstood is in some sense a failure. But it is also, as I hope I’ve made clear, inevitable. The only confused reader the satirist needs to actually fear is the “reasonable person” of the defamation statute. That aside, it is a question of finding and/or knowing, your audience. It’s an advantage of the Internet that your audience can find you. And, considering what’s out there, readers are less surprised to see something they don’t like, and authors perhaps less surprised when somebody takes offence. New Zealand has a long tradition of print satire that has included some of our greatest writers. It’s easier, in this ironical age, to see that tradition now on the hugely productive communal scratchboard of the World Wide Web than the complaint-averse print media. I’m not complaining about irony. It’s just that the very thing that gives a lot of satire it’s fun and the kick in its tail – the fact people have to work it out for themselves – means some people miss out.